I find it tragic that people of color are not better depicted in mass media, whether in movies, music, or fiction. The lack of Asian representation is a great disservice to the world, which is why I’m so happy for Kevin Kwan’s breakthrough success as a writer. After gobbling up his debut novel Crazy Rich Asians, I have been counting down the days until the release of its sequel China Rich Girlfriend. And I was not disappointed! China Rich Girlfriend is a fantastic summer read, as it follows the lives of newlyweds Nick and Rachel along with their cuckoo relatives. Rachel is briefly reunited with her long-lost father, only to have him disappear on her again thanks to his controlling wife’s meddling. The extended honeymoon she planned in China to get to know her family becomes a jet-setting distraction orchestrated by her half-brother Carlton and his girlfriend Colette. If Rachel thought that her husband’s family in Singapore was crazy rich, she’s in for a world of surprise when she learns about the billionaires of Shanghai and Hong Kong. Readers should be forewarned that although Nick and Rachel play major roles in this sequel, they do not take center stage. Significant subplots are dedicated to Nick’s cousin Astrid’s tumultuous marriage and the personal rebranding of soap opera star Kitty Pong as she attempts to climb the social ladder as Mrs. Bernard Tai. They’re certainly welcome storylines, however, as my only complaint was that the book had too many characters and not enough time to give them all enough of the spotlight! It’s so easy to get immersed in this dazzling universe of fine art, afternoon tea, and sports car racing, that I can see many more books in this series. China Rich Girlfriend simultaneously spies on the lavish lifestyles of the Asian rich and famous while reminding the audience that ‘Mo’ Money, Mo’ Problems’ is not just a rap song. Rachel has a strong head on her shoulders, and it’s refreshing to watch her pity high society than get swept away by it. After all, what’s the point of all that wealth if you’re never content enough to enjoy it? Get on this hilariously unique bandwagon before the movies hit theaters, because I believe it will be big. And if Hollywood whitewashes the films, you can be sure that I will have a meltdown of China-rich proportions! 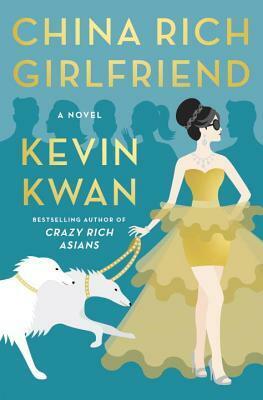 This entry was posted in Book Review and tagged book review, China Rich Girlfriend, Crazy Rich Asians, Kevin Kwan by Book Club Babe. Bookmark the permalink.